2 Beds 2 Baths 1,343 Sq. ft.
Steps to Siesta Key Beach! Bring your Boat and your Beach Chair for this Rare End-Unit Villa in sought-after Harbour Towne Yacht Club. 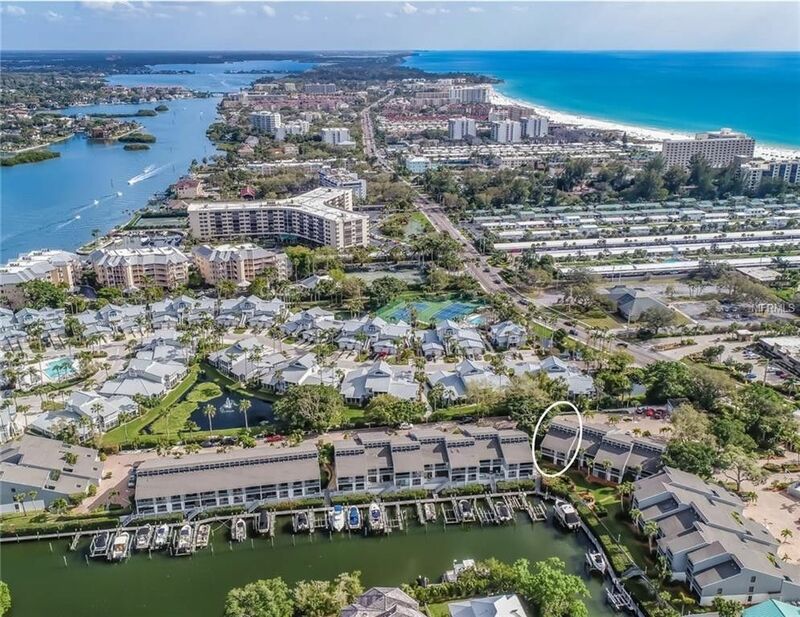 This tastefully appointed first floor 2-bedroom, 2-bath unit includes a very rare 1-car garage AND a deeded deepwater boat dock. Enjoy every inch of this well maintained and updated open floor plan with a real cook's kitchen that boasts raised panel and glazed wood and under-lit custom cabinetry, newer stainless high-end appliances, granite counters with efficient storage throughout. Entertain and relax in the dining and living space which has been extended to the enclosed lanai with custom windows and screens. Two sliders from the roomy master makes for easy access to the exterior green space and dock area. Enjoy your "cuppa" with sunrise and sunset skies and serene waterfront views from the enclosed lanai. Master bath is completely updated with private shower and large walk-in closet. Don't miss the 2nd bedroom which has serene garden views from the sliding door. Decorator finishes throughout, including custom tile, real wood floors, and so much more. If these features aren't enough, then this resort style gated community offers a heated swimming pool and spa, clubhouse, tennis court and picnic area. Terrific buy on Siesta Key so bring your sandals and your boat and live the Florida dream. Click on the virtual tour for more photos and make your offer now! Directions: Take the South Siesta Key bridge on Stickney Point Rd to the Key, go North (right) to the entrance of Harbour Towne just before the light on Beach Rd.